The future of medical waste management has arrived! Daniels' reusable Clinismart system sets new standards in infection control, environmental effectiveness and logistical cost savings and, of course, is fully compliant. 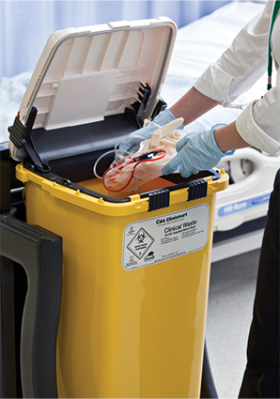 Evolved from the industry-leading Sharpsmart system, the user-friendly and aesthetically pleasing Clinismart system delivers a revolutionary advancement in the field of medical waste collection. Using a foot-pedal opening mechanism and a bagless system means hand contact with the container is not needed. This results in a dramatic reduction in the pathogen transfer risk that currently exists with standard medical waste containers. Once full, each container is removed from your premises, emptied, and then subjected to a rigorous 6-stage wash and sanitisation process to ensure the highest standards or cleanliness and aesthetics are achieved. The reusable Clinismart system can help you make a significant waste reduction impact. Clear labeling and the easily identifiable design of the Clinismart container encourages better waste segregation because the containers are far less likely to be used for general waste, resulting in fewer bin exchanges. As the Clinismart system is reusable, there are no plastic liners required, eliminating disposable plastic waste. The eco-friendly Washsmart wash process uses a fully automated wash system that even uses recycled water to ensure minimum environmental impact.